Yesterday I spent the day getting creative, I've had a mad two weeks of job applications and interview prep so I gave myself the entire day off. I shut down my laptop - a very rare sight and finished a project I started far too long ago. I'm a massive magazine hoarder, I have thousands of magazines stashed away in my room, the loft, the garage, you name it! I don't know why I hold on to them for so long? I guess I just can't bear to throw them away. Over the last few years I've collected some of my all time favourite images from an array of glossy magazines which until yesterday were all safely stored in a little brown envelope just under my bed. I got the idea a couple of years back when I saw the gorgeous Fashion Covers Wallaper by Mr Perswall, I fell in love with it but felt it would be even more beautiful if you could handpick the images that went into it. So I did just that... 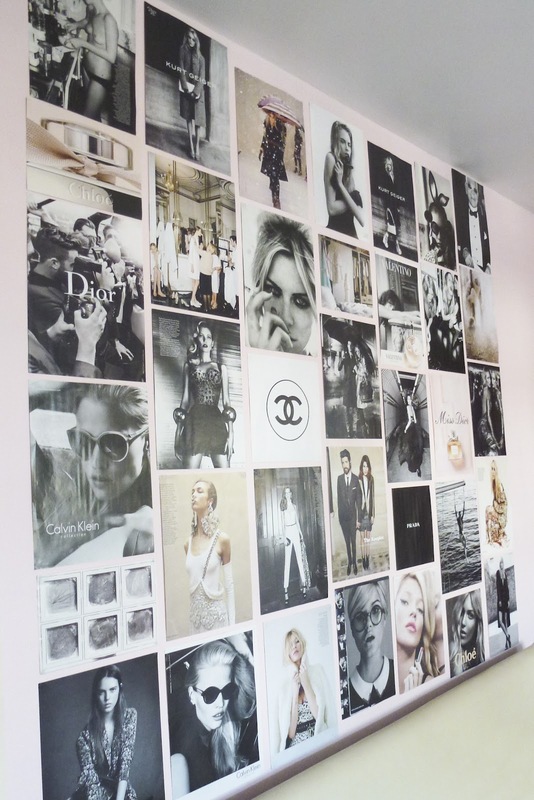 Using my carefully selected tear sheets I created my very own fashion wallpaper feature wall; custom made with all of my most-loved images from a life long collection of fashion magazines. After hours of placing and re-placing hundreds of images it's finally finished and I absolutely LOVE it! It completes my newly decorated bedroom perfectly and will no doubt inspire me every single morning. And the best thing..? 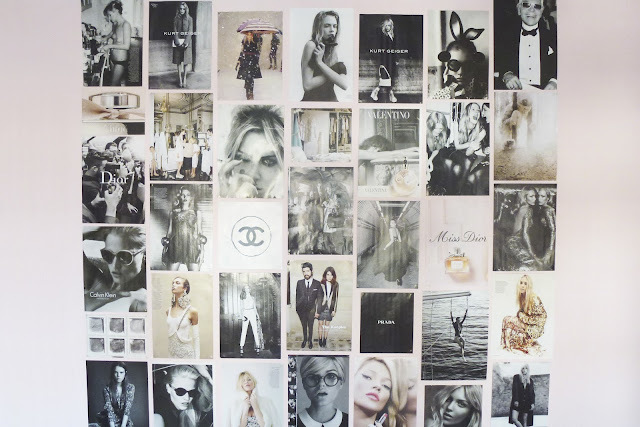 You can change or update your Fashion Wallpaper whenever you so wish! 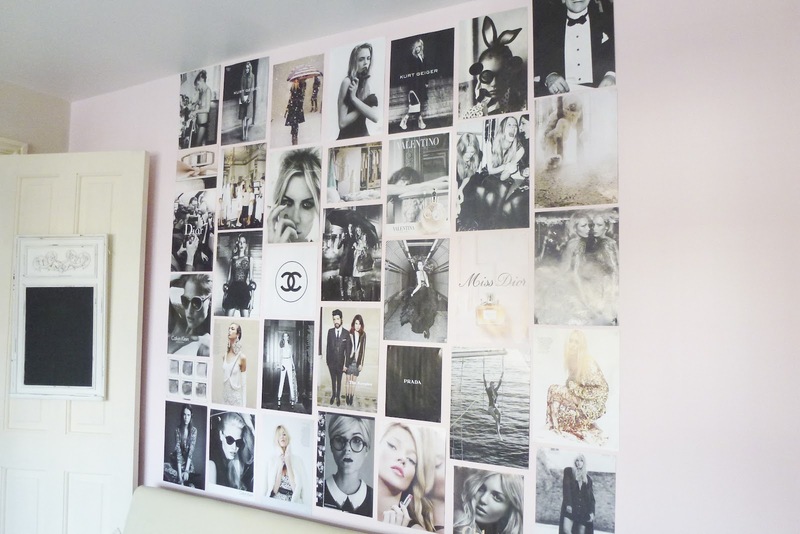 I have a fashion wall in my bedroom, Instead of the typical feature wallpaper I thought Nooo I can do better than that, so I made my own with fashion photography and a few other things thrown in for good measure. It took me so long to get enough stuff to fill the whole wall but it was worth it in the end! Love yours! How did you stick them to the wall?